I began reading graphic novels in adulthood – partially because I was very committed as a kid and tween to “reading up” (graphic novels would have been too easy! )(silly me), and partially because the kids’ graphic novel publishing explosion hadn’t yet hit. There weren’t that many gorgeous graphic novels for kids and teens about everything under the sun when I was young (or at least I didn’t know about them). If I read comics, I was reading the Sunday paper, the occasional Calvin & Hobbes compendium, and supermarket Archie comics second-hand. To put together a list like this, and really feel proud of it, I had to do some research. It was a good excuse to dive in. I checked out 30+ books from my local library, and read some others that had been waiting in the wings. Conclusion? Graphic novels are alive and well! And there are fantastic girl power graphic novels for all ages. The City on the Other Side – The setting, stakes, and various fairy characters are the stars in this story about a girl in post 1906 earthquake-ravaged San Francisco who stumbles into the middle of a fairy war. Cucumber Quest: The Doughnut Kingdom – Bright, beautiful art will draw in readers of all ages, and the magical story of siblings who may or may not be the Legendary Hero their kingdom needs will keep readers entertained. El Deafo – Cece Bell’s funny, creatively-styled graphic memoir of growing up deaf, and having a superhero alter ego (as you do) is a delight. And I don’t just say that because we share a first name. Giants Beware – Main character Claudette is set on slaying a giant – so of course she must go on a quest! With her best friends, of course. Suitable for even a slightly younger crowd – a six- or seven-year old advanced reader would love this adventure! Roller Girl – This sweet Newbery Honor book focuses on friendship and surviving the trials of middle school through the power of roller derby. Star Scouts – A space romp featuring a Hindi-speaking protagonist who goes off-planet for camp. Detailed art and robots galore. The Adventures of Superhero Girl – Hicks writes and illustrates in classic comic strip style, detailing a-day-in-the-life of a young superhero. Will appeal to those who like traditional superhero comics & slice of life storytelling. There’s also a bear fight. Lumberjanes – Female friendship is the real hero in this story of girls unraveling summer camp mysteries, fighting supernatural wildlife, and completing a magical quest. Scarlett Hart: Monster Hunter – Titular heroine Scarlett Hart wants to continue in the family business (monster hunting) despite her youth. With a tragic backstory analogous to Batman’s (up to and including a devoted butler), she’ll get her dangerous wish. My favorite part? The art. As the Crow Flies – When queer black teen Charlie must spend a week at an all-girls Christian backpacking camp, she feels like a true outsider. Gilman’s story tackles racism, feminism, and religion – a complex mix – with sincere, heartfelt grace. Also the art is awesome. LOVED this. Nimona – Noelle Stevenson’s subversive, funny, fantasy comic turns chivalry upside down. Nimona is a character with power who turns her story (or is it her villain boss’ story?) into something no one expected. I loved it. Ms. Marvel – By turns hilarious and heartwarming, this is a novel take on coming of age and discovering superhero powers – with Muslim-American family pressure and the Marvel universe tied in. Spill Zone – Horror, sci-fi, gorgeous art – there’s a lot here, but at its heart Spill Zone is a story about sisters surviving and taking care of each other in the midst of a weird world. It’s the sort of tale to make you shiver, but leave you with a gorgeous visuals you can’t forget. The Unbeatable Squirrel Girl – A superhero you’ve never heard of (from the Marvel universe) goes off to college, fights crime, and saves the world, all while trying to keep her identity a secret. Not my jam, but solid girl power. Brazen: Rebel Ladies Who Rocked the World – Possibly the most enjoyable way to absorb history and “her”story – the lives and accomplishments of women too often left out of textbooks and off of lists. Feisty fun. The Color of Earth – This quieter graphic novel by Kim Dong Hwa features the bonds between mother and daughter and the awakening of self-identity amidst rural Korea. A gem. I focused on graphic novels that had a strong “girl power” feel, but there were plenty of wonderful, girl-centric books that didn’t make the cut because for one reason or another. If you want a personalized recommendation, just drop me a note in the comments! 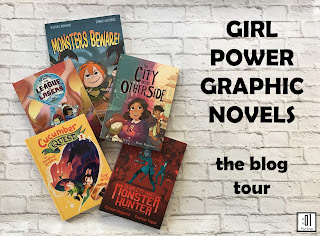 Also check out the remainder of the tour stops for the Girl Power Graphic Novel blog tour! Fine print: I received copies of the First Second graphic novels for review. I did not receive any compensation for this post.